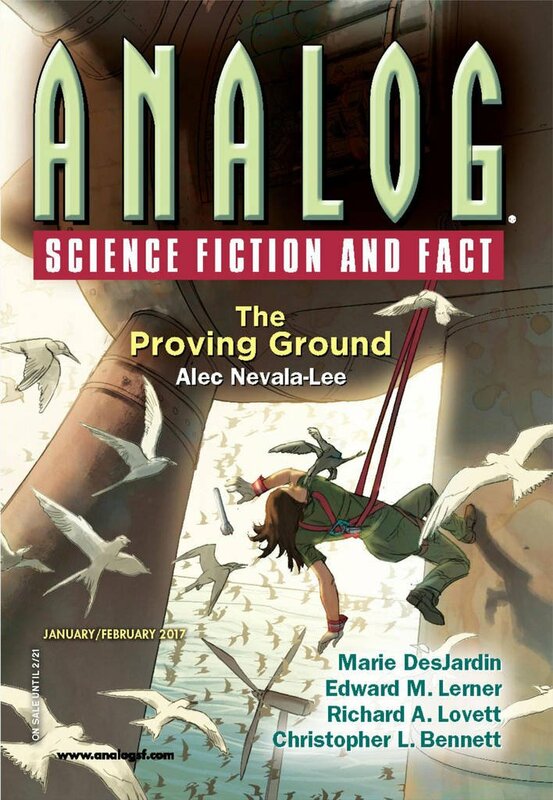 "Orbit of Fire, Orbit of Ice," by Andrew Barton [bio] (edited by Trevor Quachri), appeared in Analog Science Fiction and Fact issue 01-02|17, published on December 15, 2016 by Penny Publications. Pro: The problem of deorbiting space junk is a real and serious one. Con: The biggest problem with this story is the writing itself. The purple prose poisons the narration and the dialogue is consistently unnatural, with some as-you-know-Bob. The what-if has numerous problems. Given that the space station still had power, one wonders why it needed anyone to show up in person to deorbit it. On the flip side, it's impossible to believe that a derelict station still had air in it. Or that it wasn't tumbling. Showing up just hours before it impacted a space telescope seemed improbable. Likewise, having no choice of making a small change to the orbit (so as to miss the telescope) but without committing them to reentry. The side story about Chizuru's loss of her family didn't seem to add much to the story.